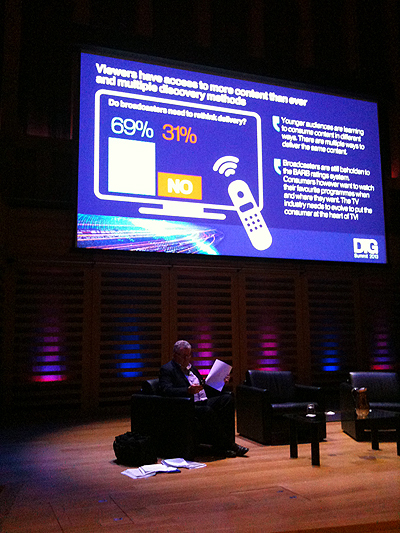 Each year the Digital TV Group, the industry association for digital TV in the UK, invites members to a summit to discuss the key issues facing stakeholders. This year focused on innovation, with a range of top-level speakers debating the challenges and opportunities of disruptive change. In the build-up to the summit the DTG asked members a series of questions on its website. Responses were captured in a spreadsheet which made its way to us to visualise as a series of slides supporting the event on the main screen in the sleek Kings Place venue, as well as on digital signage displays in public spaces outside. We also turned the slides into a souvenir longform infographic for members.